Hoverboards are the new gimmicks in the long line of technological innovations. Their demand is growing at a rapid pace. They offer a new and fun way to travel and are very intuitive to learn and as a result, it can be easily used by kids. In fact, hoverboards are in big demand as Christmas presents and kids love them. Even big celebrities are showcasing them in a cool fashion, immediately increasing the urge to buy these products. Hoverboards may be overlooked as gimmicks with not much practical use, but they can be really convenient and even give you the fun factor when traveling. It also provides smooth and uninterrupted travel, which is most suitable for short distance travel. 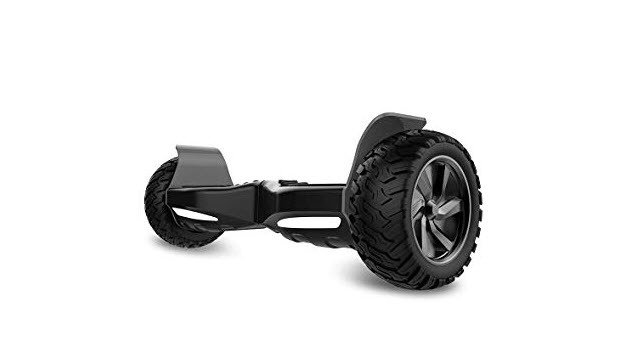 CHO TM All Terrain hoverboard may look like another hoverboard but thanks to its sturdy heavy-duty steel built and off-roading capabilities, it might be your best choice. Today, most of the hoverboards are UL2272 certified and this one is no exception. CHO TM hoverboard is an eco- friendly hoverboard, which uses advanced self-balancing technologies to keep your balance intact. It is built for any terrain and works well when you go off-road too. It has a solid build and it travels faster than most hoverboards. It is an exciting way for shuttling between places. You don’t need to be an expert to ride this hoverboard. It is very easy to use, and kids can handle it easily and efficiently. You also don’t have to worry about balancing since it uses advanced self-balancing technology to keep you from falling off more often than you can tolerate. 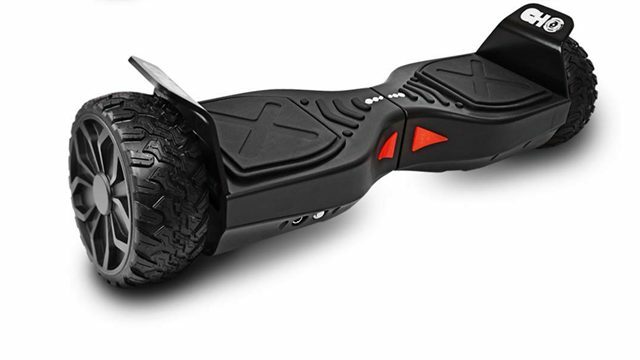 It also travels at a faster speed than an average hoverboard and makes your ride even more thrilling. It runs at 10 Km/hr speed, which is reasonably fast for a Hoverboard. However, if you plan on using it on a hill, then that top speed may trip you off since you lose control easily on a hill. It is more preferable to be used on plane land with no inclination. The CHO TM self-balancing scooter is built with premium quality heavy duty steel, which makes it durable for a very long time. The grip on the footpad is also well built and provides a consistent grip while you travel and provides the balance that you need. So, you need not to worry about falling off unless you really try to. But the premium quality used in it also makes it heavier and harder to carry with hand, especially for children. But it is easier to carry thanks to the case that they provide you with. It has self-discharge rate thanks to the Li-ion battery in it. The charging time takes around 90 – 120 minutes, which is reasonable considering the power it can hold. Depending on rider’s weight and quality of road that you are traveling, it gives you about 18-20 km on a full charge. So, you can easily travel to nearby places with a single charge without worrying about power running out. Since it is an electric drive, it is environmentally friendly and has zero emissions and you don’t have to worry about polluting the environment. It can also climb 17 degrees without any issues. But Li-ion battery can sometimes come up with some issues which are not seen in a few of the Lithium free lead acid battery operated hoverboards. It’s not a huge deal breaker, but it’s worth noting it. The CHO TM 6.5″ hoverboard is built with safety in mind first. The footpads provide excellent grip and it is UL2272 tested and certified. It provides a smooth and safe ride for both adults and children. The rock-solid build of the hoverboard makes it durable on any kind of terrain. 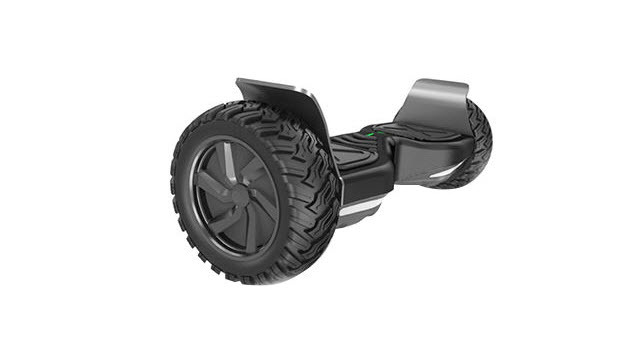 Its 6.5-inch wheels make it a breeze to traverse across muddy areas. 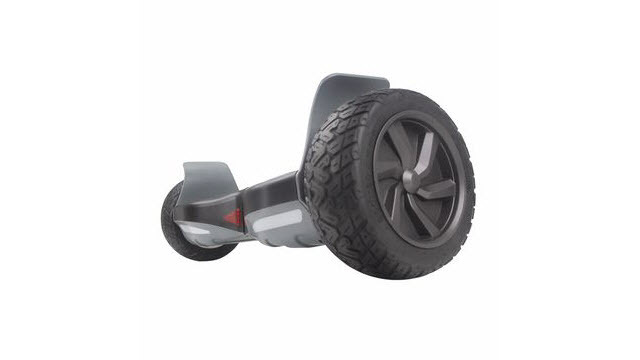 The CHO TM 6.5″self-balancing scooter comes with good Bluetooth connectivity for the built-in speakers which can play music. The speakers are of excellent quality and sound is crisp and clear. It also has LED lights in the front, which make it easier to travel on the night. But there are some issues with the lights. Sometimes it flashes nonstop and it wouldn’t reset even after turning off the power. CHO TM hoverboard with app-enabled features, which some of the other hoverboards lack. It is also fast while being safe and kids can use it very easily. This hoverboard is made for all-terrain travel, meaning you can safely ride through some muddy areas, unlike other hoverboards.